Sanskrit: mustak, jalada, shishira, bhadra, gudagranthi, sugandhi, balahak, kurubilva, ambuda, gundra,bhadramusta. 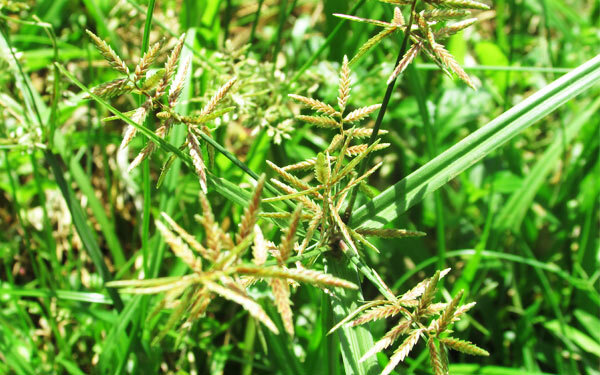 Nut Grass-Cyperus rotundus is a perennial plant, grows up to 40 cm long, commonly found in plane areas, grounds, waste lands etc., leaves are long and stem are triangular in cross section, roots are developed as a rhizome which is reddish-brown and bulb-like and fleshy. To treat fever, dysentery, vomiting, gastric disorders, nausea and inflammation. Anti-microbial, anti-diabetic, anti-malarial and anti-oxidant compounds, lysine, amino acids. How to prepare medicines: root boil in milk and drink to treat worm disturbance in children.